I know some of you out there wouldn’t dream of spending $60, $70, $80, and up for a candle. For those of you, Byredo candles obviously wouldn’t be worth the money. But then there are people like me, who would rather spend money on an excellent candle then on a night out for mediocre dinner and drinks. I get many, many hours of enjoyment from a good candle, and scent is a really powerful force in my life. Having tried every single Diptyque candle available to me, I felt compelled to move to new territory to keep my nose on its toes (haha!! Doesn’t that sound funny?). I had read relatively little about Byredo candles when compared to Diptyque and Jo Malone, but the things I did read about Byredo made me want to try their candles. If you’re new to it, here’s the scoop: Byredo is a baby of a brand when compared to Diptyque and Jo Malone. It was founded by a Swedish man in 2006, and in my opinion, offers some of the freshest and most interesting scent combinations. I am specifically referring to Byredo’s scented candles, but Byredo also makes fragrances and body care products, as well as things like leather goods and accessories. At least currently, Byredo candles really aren’t widely promoted, so its not surprising if you have no idea where to find them. I’ve gotten mine online from Neiman Marcus. Each Byredo candle is 240 g/ 8.4 oz, and typically sells for $80 and up. They promise an amazing 60 hours of burn time per candle. I’m not doing the math, but the prices seem similar per burn hour to Diptyque’s, which sells its 6.5 oz candle for $62 and its 10.1 oz candle for $90. Byredo candles come in hand blown, black, glass jars, and filled with black wax, except for some limited edition versions like Loose Lips Valentines Day candle, which I own. These candles burn at least as well as other high end candles and throw exceptionally well. My first two Byredo purchases were Burning Rose and Loose Lips. Burning Rose was a safe bet, because I know I like the smell of rose. I chose Loose Lips because it’s Byredo’s signature scent, and I read great things about it. I then wanted to explore further, so I bought Tree House (which was on back order), Loveless, and then Carroussel. My experience with Byredo candles has shown me that they’re a viable alternative to Diptyque and Jo Malone in terms of quality of fragrance, burn time, throw, and uniqueness of scent combinations. I have no qualms about recommending Byredo to you. That said, the choice of scent is going to make ALL the difference in the world about how much you like this brand. 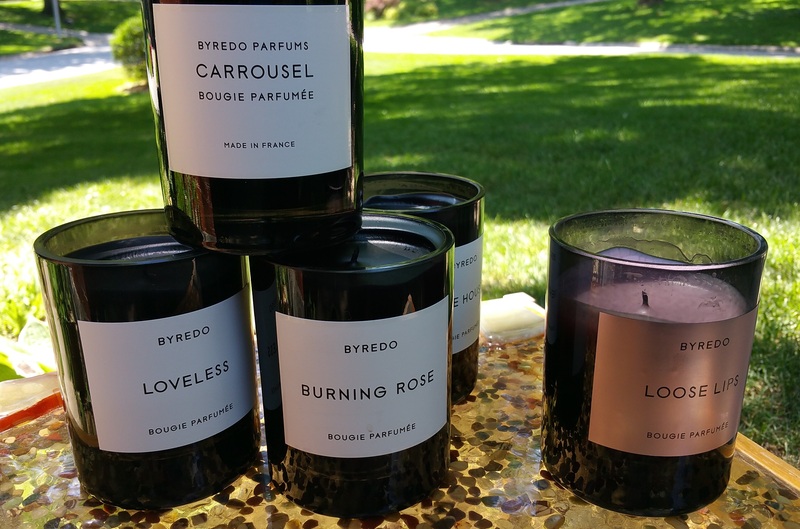 So, let me move on to reviewing each of the five Byredo candles I’ve tried. Burning Rose: This scent is composed of notes of “Rose petals, Leather, Violet, Ebony woods, and Birchwood.” When smelled in isolation, it comes across as a straightforward rose smell to me. But the nuances of this rose scent come out when you compare it to other rose scented candles. I noticed true differences between Burning Rose and Diptyque’s Roses candle, and between it and Aerin’s Rose de Grasse candle. Burning Rose is deeper and smokier than Diptyque’s Roses or Aerin’s Rose de Grasse. Diptyque’s Roses candle is probably the “truest” and most balanced of these three luxury, rose scented candles, while Burning Rose is probably the sexiest of the trio. Go for it with this candle if you are a rose lover! Tree House: The name of this candle made me think it was meant for me. I imagined it to be a woody/woodsy scent similar to Feu de Bois. Even when I read the description and saw that the notes are Bamboo, Pimento, Hay, Labdanum, Myrrh and Leather, I was still convinced for some reason that it would be deep and smokey. It turns out I was wrong though. Byredo Tree House manages to smell like fresh wood out of the box, but especially when lit it becomes very light and fresh … and green. I know from experience that I am not a fan of “green” smelling candles, and that the smell of farm field growth doesn’t appeal to me in a candle. I don’t hate Tree House, but I wouldn’t buy it again. I’d urge you to really imagine the actual notes, instead of relying on the name like I did, before spending $80 on this candle. Loveless: Once again the name of this fragrance drew me in, and the actual notes sounded appealing (except for tuberose, which I dislike): Adoxal, Mandarin, Petitgrain, Wild Tuberose, Black Cedarwood, and Papyrus. I can’t tell you how many times I thought about trying this Byredo Loveless candle, and how many times I googled “adoxal” to try and figure out what the heck it was. I still don’t quite get what adoxal is, but I’ve concluded that it’s something only perfumers really understand. I think of it as an adverb for a scent note. For example, the top notes of Loveless would be “adoxally Mandarin.” Well, whatever. I don’t think the adoxal changed the extremely prominent baby powdery smell of Loveless. I’ve burned it time and again to try and “understand” the smell, but all I’ve learned is that the powdery aura stands in the way of my truly enjoying the candle. Aside from the powdery scent, I actually smell roses again! In sum, I feel like I just don’t see eye-to-eye with Loveless. Carrousel: This was another one that I thought would smell differently than it really does, based on its name. I pictured a gourmand scent, like cotton candy, strawberries, fresh roasted pralines and deep fried Snickers bars. The notes and description didn’t do much to disabuse me of that notion, either: Cardamom, Orange, Rhubarb, Cyclamen, Guava, Juicy Fig, Amber, Blonde Woods, and Vetiver. Maybe the “juicy fig” should have cued me in to the reality: this is way overly fruity for me, and reminiscent of Diptyque’s Figuier. (My review of Figuier is here. I can summarize though, and tell you that I cannot tolerate the smell one bit.) I didn’t like Byredo Carroussel, right out of the box. But I thought it was ok when I started burning it. The citrus scent came out and made things better. But it didn’t take long for it to become unpleasant. Now I cannot even stand to catch a whiff of Carrousel while it’s completely closed in its box. Needless to say, I won’t be buying this again, and do not recommend it unless you really like the smells of guava and fig. Regardless of my dislike of, and neutrality towards certain scents, I still think extremely highly of Byredo. It’s clear that this brand is a valid high-end competitor to the gold standards of Diptyque and Jo Malone in the candle world. I’m also impressed with Byredo’s creativity and unmistakable style. I just wish I could smell all of the Byredo candles before blindly investing in my next one based upon the name and description alone. Have you tried Byredo? I want to know what you think! PREVIOUS POST Previous post: My June Target Clearance Hauls, and Drugstore Makeup Must-Haves for $3 or Less! Byredo’s scent combos are a lot less straight-forward than Diptyque’s. I like knowing that a rose scented candle will smell like roses, which it does from Diptyque. Byredo candles have been a gamble for me. I thought I’d love Treehouse, for example, because I like woodsy candles. But I didn’t like Treehouse. Byredo candles do burn very well and just as long as Diptyque’s do, though!